Ivan Moseyev. Photo Aleksei Nazarov. After the first FSB cleaner was questioned in court, the public prosecutor asked the court not to call the second: "It's all perfectly clear already". On 24 January the trial continued at the Oktyabrsky district court in Archangelsk in the case of Ivan Moseyev, the 47-year-old director of the Pomor Institute of Indigenous Peoples and Minorities research and education centre at the Northern (Arctic) Federal University named after M.V. Lomonosov. He is charged with inciting hatred and hostility towards the ethnic group "Russians" (Part 1 of Article 282 of the Criminal Code of the Russian Federation). The interests of the civil activist are being represented by the Agora Human Rights Association. Twelve defence witnesses were called today, including the chairman of the board of the National Cultural Autonomy of the Pomor People of the Arkhangelsk Region Pavel Yesilov; head of the PomorFilm studio and member of the Russian Union of Journalists Vladimir Loiter, vice-president of the Association of Pomors of the Arkhangelsk Region Vadim Medvedkov and head of the regional organisation of the disabled Nikolai Myakshin. They all spoke of the absurdity of the extremism charges being brought against Ivan Moseyev. They said they had known Moseyev for many years as a tolerant, intelligent man who is a member of the World Russian Cathedral, is one of its co-founders and has never spoken out against Russians, nor is he capable of such a thing. 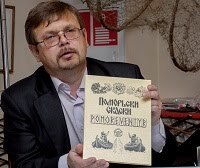 "I am surprised that such a show trial is taking place now, the main aim of which is to discredit the actions of Ivan Moseyev as someone reviving the Pomor traditions," says the head of the Centre of Slavic Culture and Medicine and head of the Union of Slavic Peoples, Pyotr Kirpita, who flew in specially from Moscow for the trial. "As a Russian and as head of the Centre of Russian Culture I see nothing that could incite hatred in the words that were analysed in court today. There is no incitement to hostility there." Today the defence asked the court to call a prosecution witness, the second FSB cleaner, whose evidence according to Moseyev "was carbon copied" from the first FSB cleaner questioned on 22 January. The public prosecutor, however, opposed the move, saying that her testimony formed part of the materials of the case and that "everything was perfectly clear already" and there was no point in bringing the woman to court. The judge agreed with the prosecutor and the cleaning woman was not called. "They are doing everything they can to put together a credible case, but to most people it is obvious that this is ridiculous," says Ivan Moseyev. "When someone on the internet calls straight out for Pomors to be shot, the prosecutor doesn't notice anything, but for an innocent phrase I used I get nabbed. They've chosen a selective application of Article 282 of the Criminal Code. The aim of the court is to discredit me and stop my activities to revive the Pomor culture and put a stop to studies of the Pomor people." The trial into the case of Pomor man Ivan Moseyev will continue in the Oktyabrsky district court in Archangelsk on 25 January 2013 at 10 am. Investigators claim that Moseyev published comments on the internet "containing degrading descriptions and a clearly expressed negative and unfavourable emotional evaluation of the ethnic group "Russians," inciting public hatred towards this ethnic group on the basis of ethnicity."